As we celebrate the Capitals’ 40th anniversary, let’s take a moment to admire existing tokens used to commemorate previous ‘milestones’ on the calendar. Two decades ago, fans got nifty 20th anniversary pucks (which, more interestingly, were made in Czechoslovakia). Once in a while, these make their way to eBay, though the 25th anniversary pucks are a lot easier to find. There were also Capitals 20th and 25th anniversary patches. Other schwag is out there, like 20th anniversary fanny packs, lunch bags, and key chains. There is also a 15th anniversary key chain and lapel pin. I’m unsure if these were stadium giveaways, but I also found a 30th anniversary pin, and 35th anniversary patch. 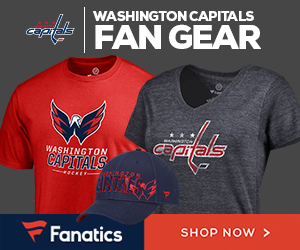 It’s been years since the Caps gave out pucks to fans (though they’re not shy about selling commemorative round-by-round playoff pucks in the team store, which are hardly collectors’ items). Seeing that the cost of a sponsored puck is certainly cheaper than a bobblehead, perhaps the puck giveaways went the way of the Clapper. I suppose it could be a safety issue, as pucks given out before games may get thrown onto the ice, while pucks handed out to fans after games may… oh who knows.